I know its not fair to pick on an old guy who should have been put out to pasture long ago. But the chief economist for Dow Jones/MarketWatch, Irving Kellner, posted something this morning so truly stupid that he deserves a smackdown——especially after 40 years on Wall Street as top economist at Chase, Chemical and Manufacturers Hanover etc. Every day brings another reason why the Federal Reserve should hold off before raising interest rates………First and foremost there was the recent plunge in stock prices. Huh? Apparently dips are now “plunges” and no longer permitted. I was actually thinking this was the obligatory hat tip to the casino, and that some better reasons for delay would soon follow. Alas, they got worse! It wasn’t that Kellner has espied a hair-curling recession lurking around the corner, which might have been flagged by the stock market’s recent 10% “correction”. There were a number of reasons advanced for its plunge, but when you peel them away one reason stands out: the stock market did not like the idea that the days of easy money, which kept equities afloat, were about to come to an end. There you have it. The case for ease is that Wall Street prefers ease. 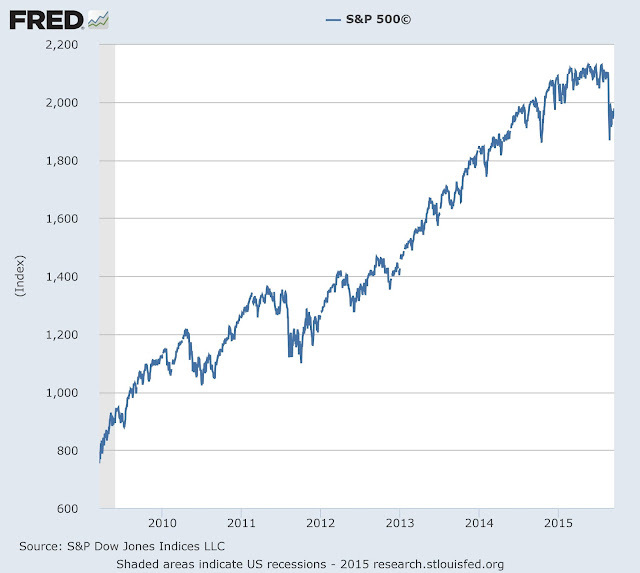 Stated differently, the Fed and other central banks have generated such an humungous and incendiary bubble that they dare not risk puncturing it——even if it means indefinitely perpetuating the absolutely lunacy of ZIRP. In fact, in his apparent dotage, Kellner argued exactly that. The Fed has to keep rates pinned to the zero bound because all the other central banks are doing the same thing. Another reason for the Fed to stand pat on rates is that most other central banks are easing. 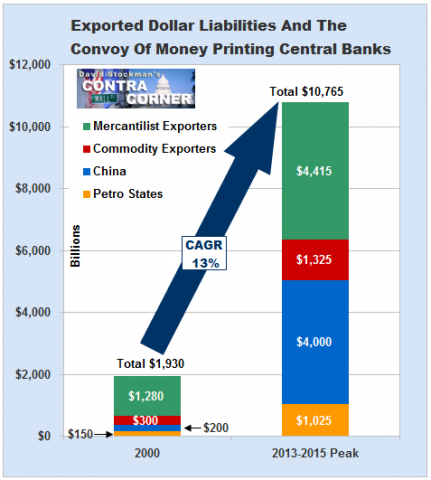 A tighter Fed at a time of global ease would only exacerbate its effects both domestically as well as internationally. Well, indeed it would, but that’s exactly the trouble. We have been in a time of “global ease” for the past 20 years running. Owing to the madcap money printing spree of the world’s convoy of central banks, the very notion of financial discipline and honest price discovery in the money and capital markets has been expurgated from the system. After Greenspan bailed-out the big Wall Street banks at the time of the 1994 peso crisis and Mr. Deng’s China went all out cranking up the red printing presses with a 60% devaluation of the RMB the same year, central bank balance sheets have been on a tear. From a combined footing of approximately $2 trillion at the time, they have now exploded to upwards of $22 trillion. This was not chump change for the bingo parlors. It was high powered central bank credit, and it has grown at 13% per year for two decades—-nearly without respite. Consequently, the global economy has become saturated with an unsustainable $200 trillion burden of public and private debt; an immense overhang of malinvestments, excess capacity and deflationary pressures; and vastly and systematically falsified asset prices owing to the massive intrusion of central banks in financial markets everywhere on the planet. Behind this were rising concerns over the state of China’s economy. Until recently it was a powerhouse that helped propel many other economies higher. Lately, however, demand emanating from China softened, dragging commodities prices down with it. …..higher interest rates will act as a brake on the nascent recovery. It will hurt exports while encouraging imports. Tighter money will also hurt interest-rate sensitive sectors such as autos and housing. Oh, c’mon. This doddering old fool is saying that if money costs anything at all, it will stop capitalist prosperity dead in its tracks. Not that several centuries of economic progress prior to 1995—-when interest rates were never zero—- would tend to suggest otherwise. Here’s the thing. Kellner’s dopey case for more ZIRP may be downright primitive and stupid, but its the essential argument of the vast majority of Wall Street economists and strategists. Like Kellner, they have been so mesmerized by the Fed’s magical printing press that they can no longer see the forest for the trees. Well, here’s the forest. The Fed is sitting on a powder keg. 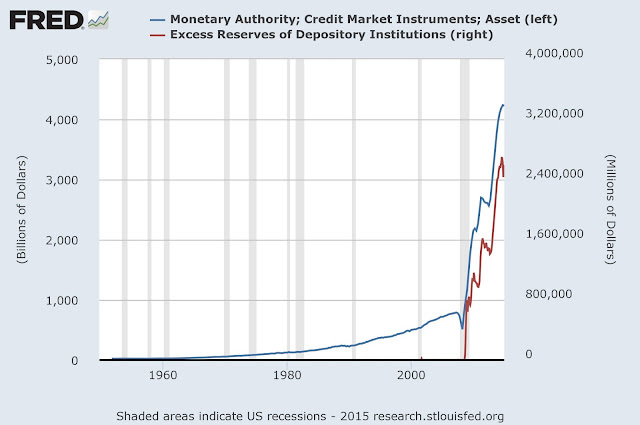 As my colleague, Lee Adler, noted the other day, the eruption of Federal Reserve credit since the early 1990s, but especially since the financial crisis, has inundated the banking system with excess reserves. To wit, so called “required” reserves are in the range of $95 billion, but excess reserves parked at the New York Fed amount to upwards of $2.6 trillion. So as shown below, the Fed’s massive credit emissions never left the canyons of Wall Street. Needless to say, this enormous reservoir of money caused a rip roaring inflation, but it was in the goods that Wall Street makes—-stocks and bonds—not the products and services generated by the factories, shops and offices located on main street. Not surprisingly, the rate of inflation remains well below the Fed’s desired range. Well, of course it is. The vast mountain of excess reserves created by the printing press in the Eccles Building may be in the custodial care of the New York Fed, but the roaring inflation of financial asset prices it enabled has spread like wildfire through the global financial system. Indeed, there is not better measure of the monetary deformation of the last two decades than the explosive growth of central bank balance sheets and so-called FX reserves among the four major sectors of the world economy outside of the US and Europe.